Thanksgiving! Although I usually do a whole duck on Thanksgiving, Yesterday I tested this guy out and here is what I came up with. 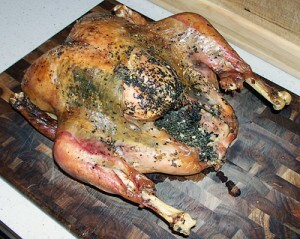 Place turkey in large roasting pan on a grate (if you don’t have a grate not a big deal). Using your fingers gently pull up on the skin on the top side of the turkey, so you can put your fingers under it. Rub the other half of the butter on the skin side of the turkey, and season with the other half of the seasonings. Roast turkey in oven for 3 to 3.5 hours (oven temperatures do vary so yours may take a little longer or less). For the last 30 to 45 minutes of cooking uncover the turkey so it will brown. Turn the pan in the oven 3 or 4 time to get a nice even brown. Use a temperature probe to insure the temp of the bird is 165 degrees (you can use the little pop up deal if you want, but it will cook your turkey to 185 degrees and dry it out) Once you have the proper temperature. Let the bird sit at room temperature of 20 to 30 minutes before carving. Easy Breezy! This entry was posted in Entrees, The Big Party and tagged Thanksgiving Turkey Recipe Roasted. Bookmark the permalink.